After the breakfast at your hotel/Riad we will pick you up to drive until we reach the UNESCO World Heritage Sit ( Essaouira ). 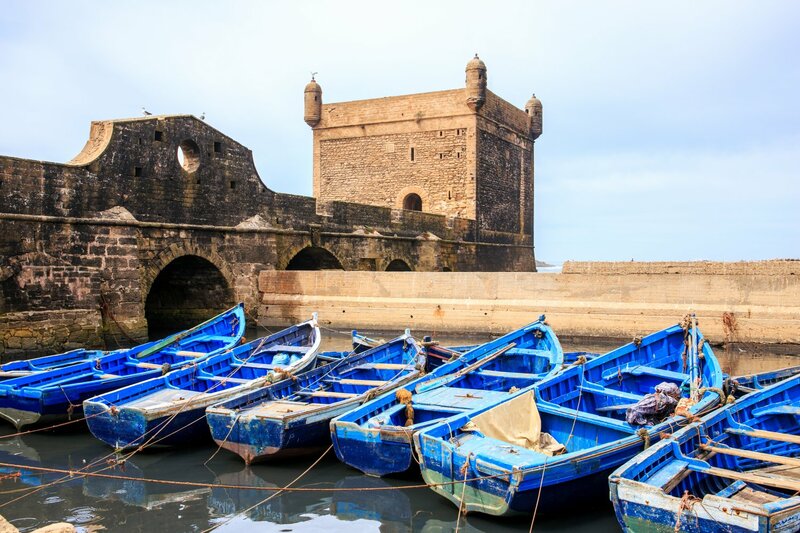 Originally built on a rocky peninsula and overlooking the Atlantic, Essaouira is one of Morocco’s must-see destinations. With a whitewashed medina enclosed by huge pink sandstone ramparts which is listed as a UNESCO World Heritage Site, and with a rich Portuguese and Andalusian heritage, Essaouira holds great appeal. From a long white sandy beach and dunes to a bustling fishing port with excellent seafood and colourful wooden fishing boats, Essaouira has always been a favourite retreat of hippies, sailors, artists and musicians. Our official local guide will ensure to explore the small town of Essaouira. Phoenicians & Portuguese Founded by the Phoenicians in the 7th century BC, the Portuguese arrived in the 15th century and established the first fortifications and a trading post. The town of Essaouira itself wasn’t built until the latter half of the 1700′s, sanctioned by an Alouite sultan, Mohammed II. It was actually a renowned French architect who designed and built the town, harbour and fortifications in the style of a European fortress. Medina & Atlantic Beach Local attractions include the Sidi Med Ben Abdallah Museum, the souks, the old city gates, and the impressive sqalas – fortified sea bastions. Perhaps enjoy a meal in one of the fabulous seafood restaurants and a stroll along Essaouira’simpressive sandy beach, In the afternoon we will return in the same way to Marrakech, You may have an opportunity to watch goats climbing Argan trees, where we will drop you off at your hotel.